1) Choosing the wrong day – How many weddings have you attended that have been interrupted because it’s the final day of the World cup? …and I’m sure that there has been more than one occasion you have declined a wedding invitation because two friends have booked the same day! Yes it can happen, so do your homework. 2) Not allowing enough time – Following on from the last point, make sure you choose a day that gives you plenty of time to plan the wedding. You may be in a hurry to tie the knot, but don’t end up with a knot in your stomach because time is running out on you. Work backwards and plan a timeline first – then decide on the day. 3) Inviting the wrong people – This is a very sensitive issue. Discuss it at length with your spouse and ensure everyone who is important to both of you has been included. Have a ‘guest list with a check list’ to ensure no-one important has been missed. 4) Not observing family tradition – Although your wedding should be very much based on your personal preferences, remember that there may be certain family traditions that need to be observed – even if it’s just a prayer or a traditional dance, don’t step on your in-laws toes at the outset, by ignoring family tradition. 5) Choosing the wrong venue – This is a big one and a common one. So many tears have been shed because the bridal couple chose a venue purely to fulfil some dream type of location and ignored all the other vital aspects of the venue’s versatility, professionalism, expertise etc. When choosing your perfect wedding venue, ensure it has a great track record of hosting many successful weddings. 6) Leaving out important service providers – It actually happens, the big day arrives but the photographer doesn’t – the Bride says the Groom booked him/her and the groom says it was the Brides responsibility – Ouch! Tears before the honeymoon! Ensure there is a service provider checklist and one person is held responsible for all wedding planning. 7) Not checking on service provider credentials – Then there is the Photographer that does arrive, but he/she has obviously never shot a wedding and doesn’t even have a plan to ensure all aspects of the photography hare covered. Even if service providers come highly recommended, ensure that you interview them all personally to make sure of their credentials and you are on the same page. 8) Not signing contracts – Then there was the photographer that never arrived because he/she had double booked weddings and yours pays the least! Well, if you had been the one with a watertight contract legally binding him/her to a fat compensation fee on failure to arrive, I think he/she would be there! Have contracts with all service providers. 9) Blowing the budget – Possibly this one should have been first! As the fees start to add up, so many people find that they had underestimated costs and before they know it they’re taking a loan to try to make the big day happen. Not a good way to start a marriage. Have a solid budget that covers everything at the outset of the planning, …and stick to it! 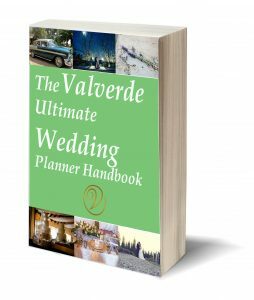 10) Not hiring/using a wedding planner – Many people find out that they possibly should have just hired a good wedding planner in the first place, but if you feelyou can’t afford it or you really want to do it yourself, then at least use a good online wedding planner, like that provided free of charge by excellent wedding venue Valverde Eco hotel. It is detailed, contains great advice and covers every aspect of the aforementioned top 10 wedding planning blunders – and how to avoid them. Happy wedding planning –and good luck! For more advice on how to plan the before and the during the wedding click here to download our Ultimate Wedding Planner.